The Bible starts with these words: "In the beginning God created the heavens and the earth". The creation story as told in Genesis is a story of God's love for mankind. He created a beautiful place for man to live. 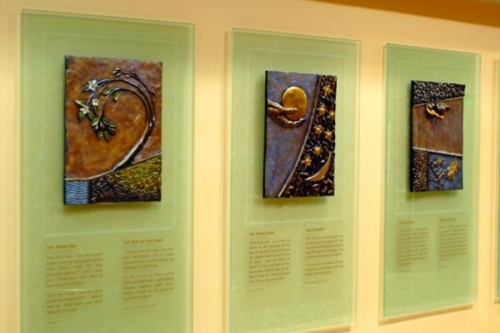 In fact I call this series of eight bas relief panels "Ineffable Love" because words cannot begin to describe the beauty in His original creation. There are many patterns, threads and symmetry woven into the account. I've attempted to capture some of them in this series. There are eight panels. The first representing the point at which time began, the other seven represent each day. The bronze castings are mounted on 1/2" glass panels which are engraved with scriptures applicable to each day. One scripture about the creation and a second about the future. My hope is that you will be as caught up as I was in the study and the making of this series.